Some stories stick with you for years. This is one of them for me. Four years ago, I interviewed Emanuel Fletcher for a radio documentary I was working on. His story of rising from fear and self-doubt to finding self-worth and the joy in serving others left a profound mark on me. When I started a podcast, I knew I had to speak with him again. As a teen, Emanuel thought he would never graduate high school. Now a husband, father, and motivational speaker, his life changed dramatically one day, he says, when an accidental overdose brought him face to face with God. Growing up in Toronto, Fletcher moved to Kitchener later in childhood and struggled with finding acceptance. “Many times, I would be ridiculed for being ‘too white’ to be black,” he says, a standard that caused Fletcher to begin changing his persona to fit the mould he felt expected to fill. Making matters worse for Fletcher was a growing problem with anxiety. When you bike across Canada, you come to learn the community of cyclists out there in any given year is pretty small. I heard about a cyclist, Eileen, that was always either a few days ahead of me or a few days behind. I first heard about her from a host family in Sault Ste. Marie — they told me about a woman who had donated her kidney to her mother and was cycling across the country a year later. “Maybe you’ll catch up to her,” they told me. Fast forward two weeks, and I heard about her again in Ottawa — a family friend working at CTV had just come back from interviewing her. He put us in touch, and just like that, the race was on — we’d text each other, joking about who was going to make it to the finish line first. By the time we got to Antigonish, Nova Scotia, our paths finally crossed. Eileen Zheng is my first guest in a new podcast series, Story Untold. Her story is incredible — I hope you’ll enjoy hearing it as much as I did. My friends and I did something unlikely not too long ago: we started a book club. I say unlikely only because of the circumstances: picture seven or eight twenty-something guys — half of whom are better known for living with their parents and gathering around Taco Tuesdays — suddenly discussing the merits of the latest Giller Prize. It’s unusual. It’s also kind of nice. What started as a way of friends in faraway cities catching up every now and then to chat about life and something in common has now become a portal into realms of reading I’d never thought to explore. Crime novels, sci-fi, historical nonfiction… all are tossed into the mix, vying to be the next month’s choice. We started with The Unincorporated Man, a vivid, half-dystopian look into capitalism taken to its extreme. A man brought back to life 300 years in the future must come to terms with a world in which individuals are controlled by shareholders, and a person’s worth is determined by their stock price. With all that said, here’s a look at what else I’ve been reading lately. 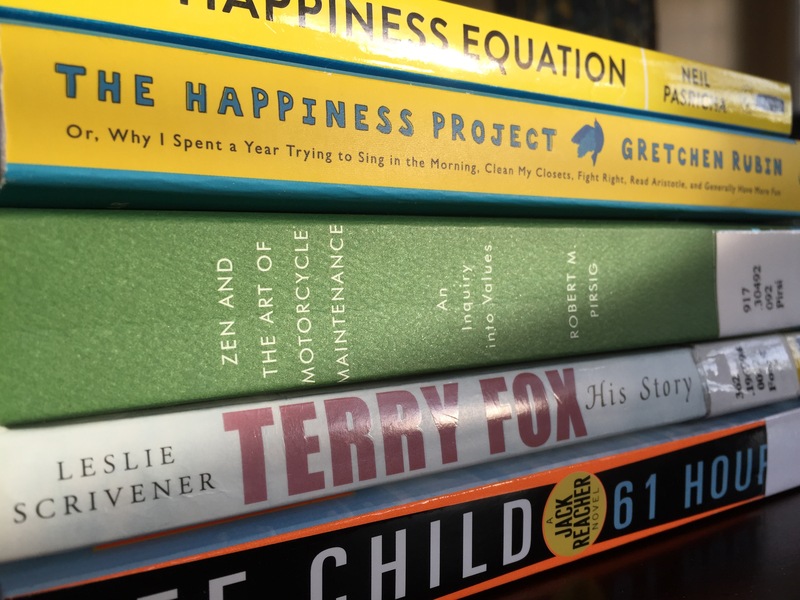 A slightly embarrassing confession: I had actually intended to read The Happiness Project by Gretchen Rubin. I first spotted a friend I met while travelling across Australia browsing through a dog-eared copy at the beach, and made a mental note to give it a read when I could. What someone really ought to have thought about when designing either of these books is that they look the exact same: yellow spine, sky blue cover, and only one different word in the title. Can I be forgiven for judging a book by its cover? Thankfully, The Happiness Equation has been a perfectly fine read. But now I’ve still got to read The Happiness Project. A slow starter, but it picks up pace as it goes along. Terry’s story has interested me for years — as it has for many Canadians — and to read entries from his journal along the run is to get a fascinating glimpse into what he was thinking at the time. I was surprised at how much of my experience in cycling across Canada overlapped with what he was feeling on his own journey: days of frustration, moments of joy, it all rang true. A slow-at-times read, but a fascinating one. Pirsig’s musings on life and investigation into his forgotten, fragmented past, woven into one long Chautauqua, makes for a hell of a story. His knack for setting a scene makes it all the more enjoyable.